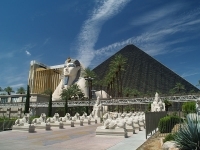 When you visit Las Vegas you quickly realise that the city itself is the biggest attraction. You can simply walk The Strip and bask in the fluorescent lights, traffic hooting, pinging slot machines, and absorb the incredible energy of this improbably fascinating city in the desert. A century ago there was nothing much here, but since then Las Vegas has bloomed into one of the world's fastest growing cities. 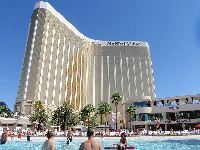 The key sites are naturally the extravagant casinos that line The Strip, all competing to attract passers-by with lavish displays and performances. 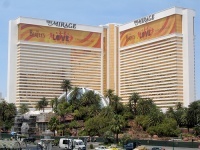 Check out the MGM-themed Mirage, the Egyptian fantasy of the Luxor, and the opulence of the Bellagio. Most people come to Vegas to gamble and party or perhaps to get married in one of the famous chapels, but the city is also an entertainment hub, offering theme parks, incredible swimming pools, giant shopping malls, and much more, which will easily occupy the whole family. 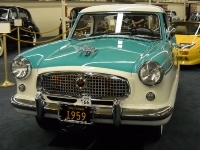 Music fans should head for the Liberace museum and the many grand shows, while automobile nuts won't want to miss the world-class Imperial Palace Automobile Collection. If exploring on foot, do so at night when the lights make their biggest impact and the temperature is cooler. During the day make the most of the city buses which run the length of The Strip. We are looking for contributors for our Las Vegas travel guide. If you are a local, a regular traveller to Las Vegas or a travel professional with time to contribute and answer occasional forum questions, please contact us.